Victorian Poetry in Context offers a lively and accessible introduction to the diverse range of poetry written in the Victorian period. Considering such issues as reform and protest, gender, science and belief this book sets out the social and cultural contexts for the poetry of a fast-changing era. Sections on Victorian poetics, form and Victorian voices introduce the key literary contexts of poetry's production, and poetic innovations of the period such as the dramatic monologue are highlighted . At the heart of the book is a focus on the importance of attentive close reading, with original readings offered of well-known texts alongside those that have recently received renewed attention within scholarship. The book also offers an overview of critical approaches to several key texts and discussion of how Victorian poetry has remained influential in the twentieth and twenty-first centuries. 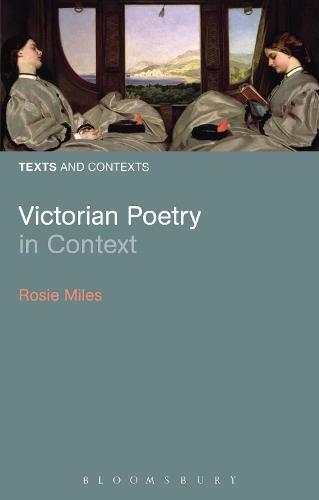 Introducing texts, contexts and criticism, this is a lively and up-to-date resource for anyone studying Victorian poetry.